C asked for a new bag, like this. I told her to pick some fabric, and when she asked "Any fabric?" I thought I might be in trouble. I knew she'd pick Freshcut, it's definately a favorite of hers. Lucky for both of us I've gotten over my hesitation to use good fabric! 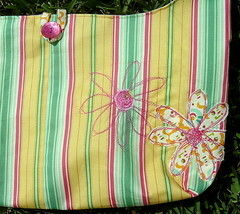 She picked the striped and I added the other as accent, and even a dot of another for the center of one of the flowers. I'm not a big fan of free motion quilting, because I can't get the stitch length to be consistent, but I had so much fun doing these flowers. It was fairly therapeutic, moving the fabric to the calm repetitive stitches. I can't wait to do it again - my mind is just filling with ideas. Speaking of free motion quilting ... I was looking at this quilt I'd made and said "Wow Mommy, you must be really good to get all these stitches different lengths." Have I mentioned lately how much I love him? When I make this bag again, and I will ... it was pretty easy, I'll make it deeper and maybe even a little narrower. 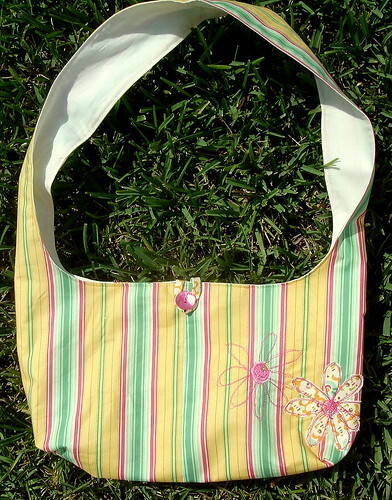 And I'd like to make the shoulder straps longer so I can tie them at the top, just to give it a little more character. I just love everything you do. Your colors must just be exactly what pleases my eye - your scrappy quilt is so wonderful. Sigh...wish I had your talent for the fabric arts! My sewing machine, which I've never mastered, is gathering dust.